How do NFL teams allocate resources? Dave Archibald has looked at the real price of contract extensions and draft picks on quarterbacks. In this installment, he looks at how teams evaluate running back investment. Bellcow backs take punishment throughout the course of a game, and season, often leading to short careers – and relatively modest contracts. Teams might turn to the draft instead, but busts like Ki-Jana Carter, Cadillac Williams, and Trent Richardson have made some teams wary of using top-five picks on the position. What was once the NFL’s marquee position is now where many teams try to get by on the cheap. The chart below shows the amount of money and draft value expended on the running back position. Money is measured by average cap hit. This is not a perfect measure, as it can be inflated by “funny money”, or non-guaranteed years tacked on to the end of the long-term deals, but it serves as a rough indicator. Draft value is measured by cumulative Draft Trade Value Chart figures through the last four years, plus 2011 first-rounders (more on that methodology). These figures represent players currently rostered as of the beginning of the season, not “dead” money or draft value spent on RBs no longer with the team. They also do not incorporate traded picks or players. There are four groups according to spending pattern. Interestingly, more investment doesn’t necessarily translate to better production. 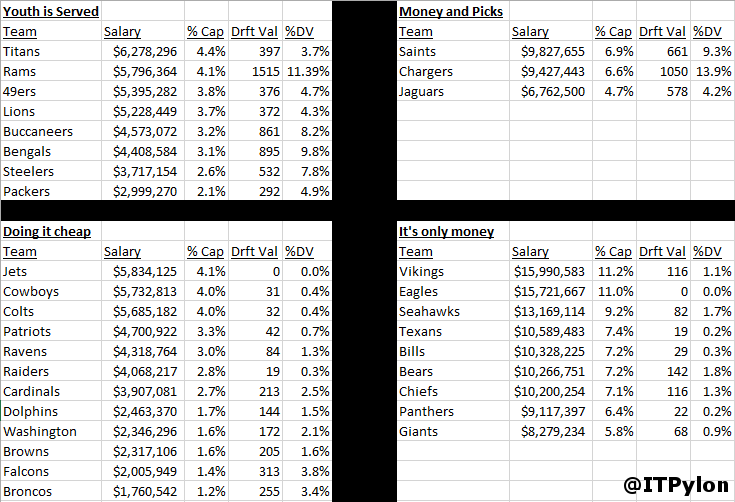 Money and Picks: Three teams allocate a higher-than-average amount of both draft capital and salary to halfbacks. Each of these teams added significantly to their running back stable this recent offseason: the Saints signed C.J. Spiller ($4 MM salary) as a change-of-pace to 2011 first-round veteran Mark Ingram, while San Diego and Jacksonville invested high picks in the 2015 draft at the position, tabbing Melvin Gordon (#15) and T.J. Yeldon (pick #36), respectively. Gordon and Yeldon are intended to upgrade performance from an underachieving player signed in the 2014 offseason, as Toby Gerhart and Donald Brown (both $3.5 MM average salaries) have failed to produce commensurate with their deals. All three of these teams figure to move out of this quadrant next offseason, with Ingram no longer on his rookie contract and Gerhart and Brown likely cut (Brown has already been cut and brought back once this year). Notable performances: Surprisingly, all three teams are getting below-average performance from their backs as measured by yards per carry. Jacksonville’s 3.3 YPC from its backs is second-worst in the NFL; its team average is a respectable 4.0, but that’s dragged up by quarterback Blake Bortles’ 8.0 YPC. It’s Only Money: This category (above average investment in salary, below average on draft picks) is where most of the star power lives, with Peterson (Vikings), DeMarco Murray (Eagles), Lynch (Seahawks), Arian Foster (Texans), LeSean McCoy (Bills), Matt Forte (Bears), and Jamaal Charles (Chiefs) all recognizable names in fantasy drafts across the nation. Carolina is near the end of an unfortunate extension to Jonathan Stewart, a solid player when healthy but not worth his $7.3 MM average cap hit. The Giants spent big this offseason on pass-catcher Shane Vereen (3 years, $12.35 MM) to complement Rashad Jennings ($2.5 MM average cap hit). Since each team in this quadrant has quality veterans, they’ve generally avoided augmenting the position through the draft, with Minnesota (Jerick McKinnon, 96th pick in 2014) and Kansas City (Knile Davis, #96 in 2013) rostering the only players drafted in the first three rounds among this group. It should be noted that the Giants (David Wilson, #32 in 2012) and Seahawks (Christine Michael, #62 in 2013) did make significant draft investments, but neither of those players is currently on the team. Notable performances: The Seahawks, Chiefs, and Vikings all have top-five rushing attacks at 4.7 YPC. The Texans are 29th, though that figures to improve as Foster gets healthy. The Giants are 30th at 3.4 YPC. Youth Is Served: These eight teams have avoided spending big money on running backs, but each drafted at least one running back in the first two rounds in recent seasons. In the case of St. Louis, Cincinnati, and San Francisco, they’ve drafted more than one. 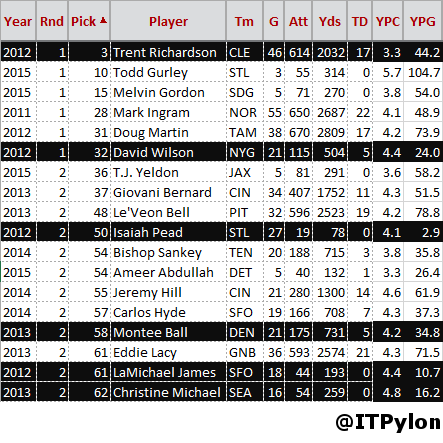 Below is a chart of all running backs taken in the first two rounds under theoretical team control. It is clear that a high draft pick is no guarantee of high production. Six of the 18 players listed have already been cut or traded by their initial teams, and four of those – Richardson, Wilson, Pead, and Ball – are not on any NFL roster. The remaining 12 are a mixed bag, with Bell and Lacy two of the game’s young stars, the Bengals getting good production out of Hill and Bernard, and Ingram and Martin proving inconsistent. The jury’s still out on the second-year players like Hyde and Sankey, and the 2015 draftees. Teams that draft backs high usually hope to get a bellcow back like Lacy or Bell without investing much money, but odds are they will end up disappointed. Notable performances: Pittsburgh is #2 in the NFL at 4.8 yards per carry. The Lions are dead last with a putrid 2.7 YPC from their backs. The Rams are eighth at 4.4 YPC and may improve as rookie Todd Gurley (5.7 YPC) takes on a bigger load. Doing It Cheap: The largest group at 12 teams, these are trying to get by while spending less money and less draft capital than average. Some of these teams have spent on running backs, but have already moved on from failures – the Broncos cut 2013 first-rounder Montee Ball after two underwhelming seasons, while the Browns traded away 2012 first-rounder Richardson just 17 games into his career. Richardson burned the Colts too, as they spent a first-round pick to acquire him, ultimately cutting him after fewer than two full seasons. Notable performances: Arizona surprisingly has the #1 attack at 5.4 YPC from its backs. The Patriots and Ravens are getting 4.5 YPC, virtually tied for sixth. Denver (3.5 YPC, 28th) and Cleveland (3.6 YPC, 27th) are among the worst. Most of these teams have one back that they feature heavily in the passing game. Bernard, Bell, Spiller, Sproles, and McCluster have all had 40-reception seasons, and Sims is on pace to reach that mark in 2015. The Jaguars and Chargers are different cases, as Gerhart and Brown have been disappointments and are relegated to true backup status. The Eagles splurged heavily on both Murray and Mathews this offseason, but it hasn’t helped them much so far, as their 3.8 YPC in 2015 ranks just 25th in the NFL. The fullback position has been largely de-emphasized in the modern NFL, and the amount teams spend on the position bears that out. Reece and Tolbert, while officially classified as fullbacks, touch the football more than most of their counterparts, making their roles more akin to running backs or tight ends at times. That means only six pure fullbacks are making more than $1 MM per year. Teams have been even more reluctant to part with draft capital for fullbacks, with only eight fullbacks drafted at all since 2011 (two not on current rosters), none higher than Fowler and Juszczyk in the fourth round. The data bears out the notion that the running back position has been devalued generally, though some teams continue to invest significantly in the position. Interestingly, higher investment hasn’t translated to more production in the run game. Perhaps spending more on backs means spending less on offensive lines – a theory to be evaluated later in this series. It is not clear that teams are good at evaluating running back talent, given the number of draft busts and failed free agent signings. The future is unclear: if Gurley and some of the other young backs establish themselves as game-changing stars, the devaluing of the position may cease. Until then, it appears the smart teams are investing little in their running backs – and getting solid production just the same.